When designer couple Mark Eley and Wakako Kishimoto were first introduced to each other by an enthusiastic friend all the way back in 1989, neither had the faintest idea that their last names would exist as a powerful conjoined entity 28 years later. Eley, a sentimental Welsh boy, and Kishimoto, a bashful Japanese girl, were in New York at the time, interning at separate fashion and textile firms. The two discovered an affinity towards each other and traversed the Big Apple together soaking in the verdant parks, the throbbing clubs and the exquisite art galleries. Three months later, they returned to the UK to complete their degrees — Eley to Brighton and Kishimoto to London. The next time the two crossed paths was a year later when they happened to be at the same pub in the English capital and Kishimoto recognised Eley’s bag outside the door. They had a few drinks, winding up thoroughly inebriated a couple of hours later and all previously instated dictums of Platonism went out the window. And although Eley confessed to harbouring nihilistic views with regard to marriage at one point, the possibility of losing Kishimoto when her student visa expired was enough to shut the door on his conjugal reluctance for good. 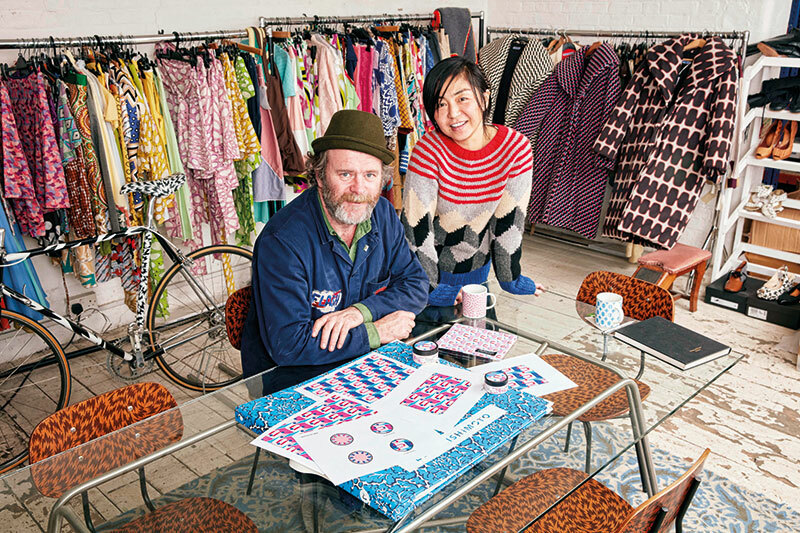 The design company Eley Kishimoto was born on May 2, 1992, also the day the couple tied the knot. Subsequently, their exuberance began manifesting itself through their design aesthetic which was eclectic and vivid, but never lurid. Their prints found takers in illustrious designers like Versace, Yves Saint Laurent, Alexander McQueen and Jil Sander among others. In 1995, the label produced its first independent collection titled Rainwear which saw PVC-coated fabrics morph into umbrellas, waterproof coats and gloves in their trademark ‘flash’ print which, quite literally, resembles lightening. The designers have since steadily expanded their repository of offerings to include crockery, furniture, wallpaper, luggage, sneakers, lingerie and sunglasses. Marking their foray into the beauty segment was a collaboration with The Body Shop, where they lent their vibrant palette to the brand’s packaging for the Vitamin E hydrating moisturiser. These products have now made an appearance in the Indian market with The Body Shop India launching them as a limited-edition line. Verve gets better acquainted with the duo, who alternate between being life mates and business partners with extraordinary ease. Mark Eley: I recall spending time with my grandfather in his workshop since as far back as I can remember. He was a commercial artist who specialised in scenic paintings, prop-building, sign-writing, printing and set design. He always worked on personal projects and commissions on the side and would get me to assist him. It must have triggered some dormant artistic gene in me when I was ten which only got more active with age. I had a close-knit group of friends who worked in creative fields and it was quite natural that I attend art school when I grew older. It honestly felt like a homecoming of sorts. What made you gravitate towards graphic prints? Eley: Our individualistic personalities and early fashion productions made us realise that we would never be satisfied with a run-of-the-mill aesthetic. The process of screen printing, which used to be at the core of our identity, gave rise to easily identifiable graphic outcomes. It was through these prints that we initially built our reputation. Wakako channelled a unique combination of her capabilities through careful drawings, unrestrained colours and giddy patterns which is the reason why we are where we are today. Wakako Kishimoto: To be honest, I am not prejudiced towards any type of pattern as long as it is malleable enough to bend to my will. But when it comes to our graphic prints, there is something quite hypnotic about simplifying shapes and objects, while maintaining the narrative of the leitmotif in its entirety. It’s like looking at the pieces of a puzzle and the completed puzzle simultaneously. Name a few of your favourite projects. Eley: Off the top of my head, working in our local area as creative ambassadors of Brixton Windmill besides being inaugural committee members for Brixton Design Trail is personally fulfilling. One of our commissions involved applying our pattern to a number of pedestrian crossings in Brixton to raise awareness about the district being an important cultural hub of South London. Civilians were touched by it and that made us happy. Kishimoto: I used to labour over our seasonal fashion collections and I have so many fond memories from those times although it was a very arduous phase. We have now moved on to a bigger playground when it comes to design and are able to learn new things at each turn which is really very refreshing. Which are the projects that excite you? Eley: Any collaboration that allows me to breathe life into our brand philosophy of ‘patterning the world’ makes me feel like I’ve struck gold. We’ve also progressed to a more holistic approach when it comes to selecting projects and tend to veer towards the ones that will benefit communities and the environment. Kishimoto: For me, it’s all about working with good people who return the respect we confer on them. I usually shy away from conflict and have come to appreciate clients and employees who maintain sound professional decorum. Eley: Arriving at the sweet spot between the business aspects of what we do and being honest to our vision sometimes proves to be tougher than it looks. We are very sure of the direction in which we are headed and won’t associate ourselves with anything that will cause us to deviate from the path we have forged so painstakingly. This kind of compromise is also unfair to anyone who engages with our work since our displeasure will be imbued in the project we execute. Kishimoto: To sum it up, sustaining ourselves well within our means without losing our creative integrity is a little testing at times. It doesn’t happen a lot since most of the people we’ve worked with so far have been blessedly sincere. But every once in a while, we’ll come across a hurdle which takes up a lot of our mind-space that we’d rather reserve for work pursuits. Who are the designers you look up to? Eley: If I had to pinpoint one person, it would have to be the Japanese conceptual artist On Kawara who passed away in 2014. I always had a soft spot for him and his loss feels like a physical void. Kishimoto: I don’t have any design inspirations, so to speak. But if I come across someone who has unbridled dedication and passion, accomplished skill and positive mental strength, a sense of humour and a kind heart, they effortlessly metamorphose into a hero in my eyes. They speak to my spirit regardless of the profession they are from; they could even be a regular person in the eyes of the world. How do you resolve design conflicts that arise between the two of you? 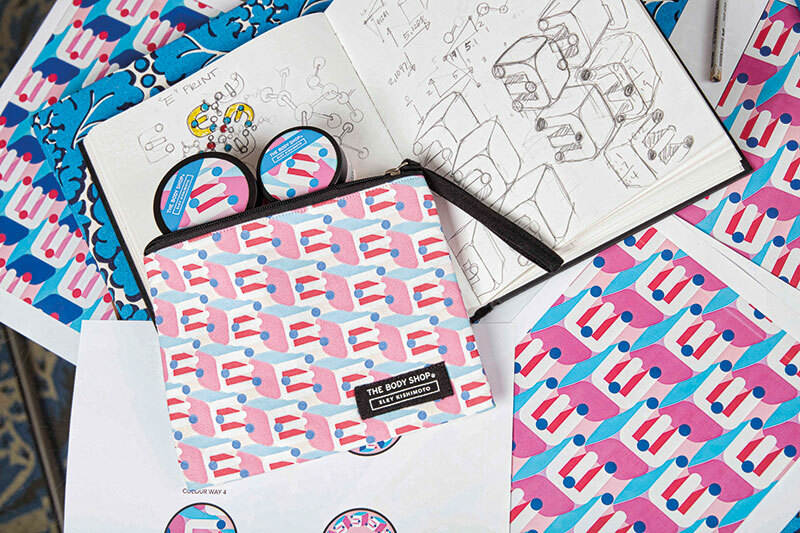 Eley: Now this may sound like I am fibbing, but with all the joy that Eley Kishimoto has created as a brand in the last 25 years, Wakako and I have had very little cause to disagree. It’s true that we are like chalk and cheese, but I believe that works in our favour because we balance each other’s temperaments. Kishimoto: Although we both have an equal stake in the company, one of us usually takes the lead on every project that comes our way. That way, we keep out of each other’s hair. After working together for so many years, we are intuitively aware of what’s on the other one’s mind. We value the space but depend on each other’s expertise. It’s all like clockwork, really! Eley: My engagement with the local community has grown by leaps and bounds. I have been investing a good amount of time collating all the intelligence I have gained from our global ventures and infusing it into local projects that have a social impact. It feels like we’ve come a long way from our original philosophy of ‘making the world a prettier place’. For me, it’s now more about ‘making home a good place to be’. Kishimoto: I think of us as professional amateurs who have acquired a certain set of skills, doing what we love in an environment that is conducive to our creativity. While our works are digitally available now, I wish to maintain this closeness to the tangible creative process while co-existing with the future that awaits us.